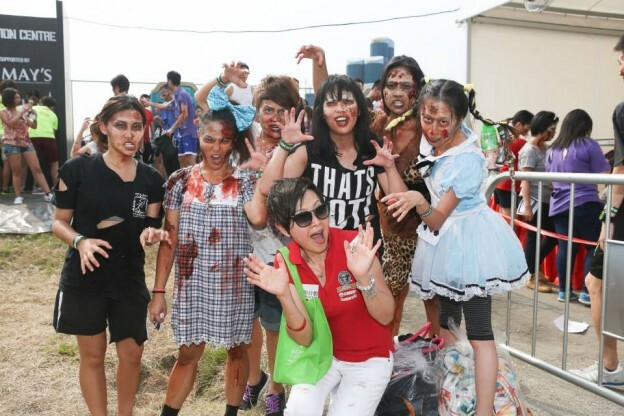 Run For Your Lives Hong Kong – Let lives extend with love! Will In Action was selected as the Official Beneficiary of a 5km international race – Run For your Lives Hong Kong, which is an obstacle run with a lot of fun. It’s successfully held on Thursday, 2nd October 2014 at West Kowloon Waterfront Promenade, West Kowloon Cultural District. The response was overwhelming! Action X, the event organiser, not only sent us donation, but also arranged a promotional counter for us to spread the message about organ donation to 13,000 “Zombie” and “Survivor” participants. We also spread the positive message of “Capture the moment, Cherish now!” via instant photo charity sales on spot. The donation generated from the event will go to a special scholarship fund for supporting those passionate in organ donation to attend related overseas programmes and conferences. We hope the applicants acquire the most updated and useful knowledge and contribute to the development of organ donation in Hong Kong. This can help to attain life from death for those end stage organ failure patients who are desperately waiting for an organ.